Search engine optimization is one of the most important aspects of your website. Comparable to an anthill, Dental search engine optimization takes hard and consistent work from everyone involved to gain the desired end result, visibility and easy access for the potential users of your services. On our services page we discussed the services we provide and what we do to help increase your rankings in search engines. These services are interrelated with each other and are extremely important to your results as demonstrated by the ranking algorithms that search engines use to decide in what position to put your site. One of the most common misconceptions about SEO for dental is that results are immediate and are relatively easy to achieve. There are many factors that can come into play when increasing your organic rankings. One of the main factors is the competitiveness of the keyword you are targeting. If the keywords are extremely competitive then it will take more time and patience to see your desired results. Below is a screen shot of an actual example of increased traffic and higher rankings for keywords as a result of our services. 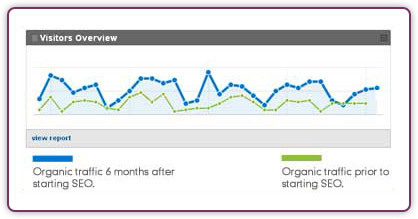 Our tracking software will allow you to view the progress of your ranking throughout the optimization process. We provide detailed ranking reports on a monthly basis to show you your keywords and how they rank according to the major search engines.